A complete view and details from Infinite Loop, by Nikos Fyodor Rutkowski. The exhibits by Terry Welker and Nikos Fyodor Rutkowski at the Rosewood Gallery, running September 21 - October 16, are both gorgeous manipulations of space. Entering on Rutkowski's side, your attention is drawn to the single piece in the room, Infinite Loop. The artwork is comprised of eight panels, stretching the length of the far wall, the rest of the gallery is left dark. This minimal presentation allows the viewer to focus on the work in it's entirety, and there is a lot to see! When I spoke with Nikos, he explained that the piece is representing the life-cycle, with birth on the left and death on the right, and the black ends connecting the two states of being. I too have been thinking a lot about the cycles of life, but my focus has been my father's illness, whereas Rutkowski is inspired by his young son. The surface is vibrant at first glance, then your eyes adjust and begin to piece apart the various layers, many of which are constructed from overlapping clothing patterns and antiquated graphic design elements. Over these layers, he builds paint and colored pencil to create glazes of color that vibrate within the structured lines and behind scumbled veils. I am going to have to take a little credit for bringing Nikos Fyodor Rutkowski to Rosewood Gallery, since it was my email prompt that motivated him to apply for a show, but then I have to admit that I did it for selfish reasons. I really wanted to see his work in person and I am not disappointed! Tracy Flagg, Rosewood Gallery Coordinator, is so lucky to have this as her view for the next month and you should check it out too! Chillin' on and within the installation by Terry Welker, #theconsent. In case the work by Nikos Fyodor Rutkowski is not enough motivation, know that you will also have the pleasure of experiencing the installation by Terry Welker. He is known for transforming spaces with his unique take on the mobile art form. 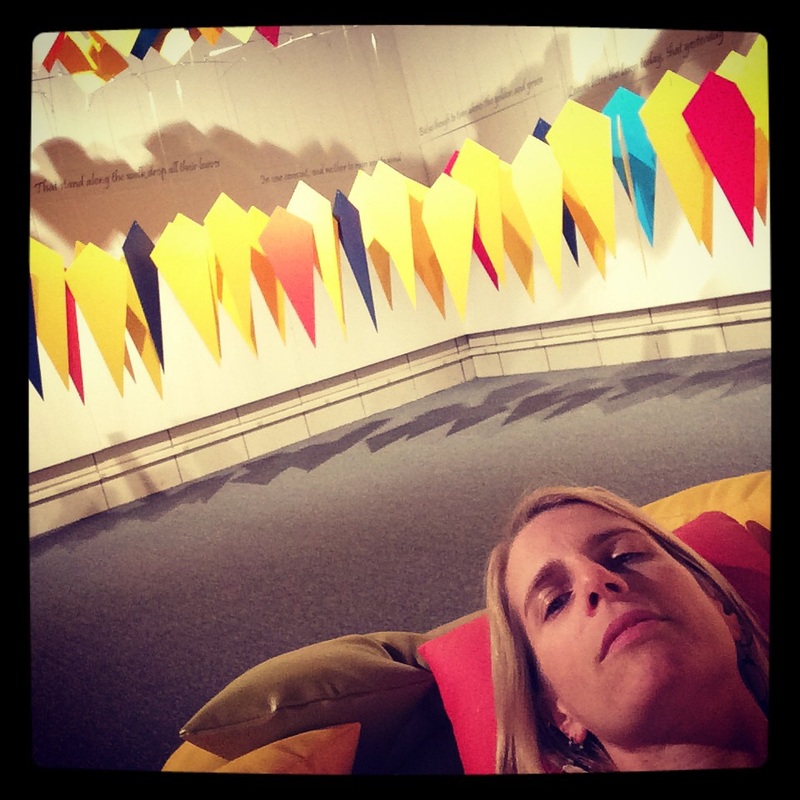 For this installation, Welker invites you to enter the gallery and rest on abstracted ginkgo leaf pillows. From there, you are surrounded by the soft sway of colors and peeks of poetry. I definitely need to go back to experience this work in the quiet gallery. For the opening reception, it was the colors that really stole the show, popping off the neutral wall and twisting in the air currents. This installation also reflects on the changes and cycles of life, but focusing on nature and the seasons to express the idea.